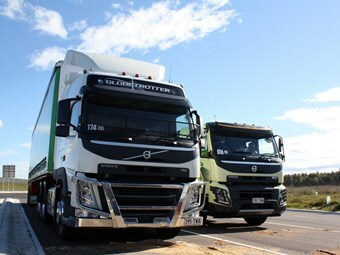 ATN checks out the new Volvo FE and FM models, along with Volvo's Dynamic Steering Technology. Hot on the heels of the Australian launch of the new Volvo FH flagship last year, Volvo Australia has launched the updated heavy rigid FE and the FM prime mover. The baby FE is a premium product in the rigid market and is available in 4x2, 6x2 and 6x4 guise with a GVM of up to 28,500kg. Volvo touts the flexibility of the FM platform, which can be found in local single trailer, tipper and B-double roles with a GCM of up to 68,000kg. The updated FM has benefitted from a cab update and a new interior that brings it in line with the new family look of the Volvo range. Volvo's I-roll freewheeling function is available which lets the engine idle while the vehicle free wheels in undulating terrain. The I-see terrain mapping function is also on the horizon. The construction spec/off roader FMX has also benefitted from the update and Volvo has revealed that the whole mud-bashing FMX range can now be manufactured locally, from 6x4 to 6x6. The FE uses a 7-litre SCR engine with power outputs from 260-340hp and torque figures of between 1,010Nm to 1,300Nm. While the Euro 5 driveline is unchanged, the little Volvo is now also available locally with a Euro 6 driveline as well. Both 11-litre and 13-litre drivelines are available with the smaller engine covering power outputs from 330hp to 450hp, while 13-litre outputs are from 460 to 500hp. Both are backed by the 12-speed I-shift automated manual transmission (AMT). Traditionally, transmission choice has been limited to a six-speed torque converter auto or a nine-speed manual gearbox, and Volvo's I-shift was previously only available on the heavy duty FM and FH models. The all-rounder Volvo FM tends to fill local, intra and interstate distribution roles while the heavy duty FH remains the company's linehaul hero. Stopping duties are handled by disc brakes all round and an electronic braking system is standard equipment. It is the arrival of Volvo Dynamic Steering (VDS) for the FM and FH models that really stands outs amongst Volvo's bag of tricks. VDS is an electronically assisted power steering unit that provides up to 25Nm of torque assistance to the conventional hydraulic power steering of the truck. The system can make up to 2,000 adjustments per second and varies the amount of assistance depending on vehicle speed. Volvo claims VDS reduces the amount of effort required by the driver to turn the wheel by up to 85 per cent. We spent a day driving different examples of the Volvo range from FE to FM and even the FH. Some trucks were equipped with VDS and some were without which gave a good sense of the impact that the function makes on vehicle handling. At low speeds and reversing in particular VDS was impressive; the steering wheel could be spun with just one finger and would quickly self-centre when let go. On the open road, however, it was hard not to over steer the truck as instinct kicked in. VDS does take all of the kick out of the steering wheel on rough surfaces and this was very apparent on roads with broken asphalt edges. However, road feel through the wheel does tend to be compromised and the wheel can feel a tad dead at highway speeds. While at the wheel of a VDS-equipped FM Globetrotter, I dropped the wheels off the edge of the country blacktop to see how the steering unit would behave. And while it hauled the combination back onto the road quite easily the lack of feedback through the wheel made it difficult to feel where the road edge was until the wheel actually dropped off. On multilane freeway, however, the system was exceptionally smooth and was pretty easy to keep between the lines even with a pretty savage crosswind blowing. The $6,000 VDS option would shine in local B-double and single trailer delivery roles as well as tipper and dog and off-road roles where drivers spend a lot of their day spinning the steering wheel in tight spots. However, the standard steering setup handles that well out on the open road that I'm not sure VDS provides that much extra out on the highway. Read the full review in the August edition of ATN. Click here to secure your copy today.